This is the smallest Philippine plover. It is usual habitat is described in the Kennedy guide as "isolated sand and coral beaches". 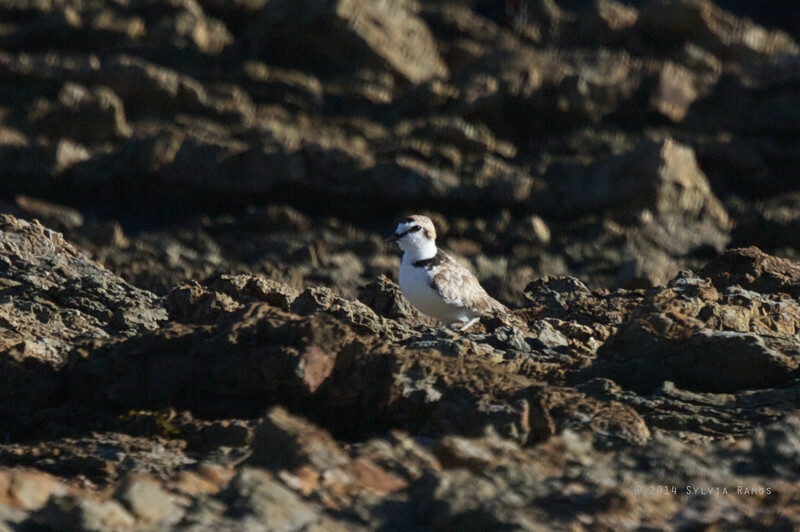 Unlike other plovers, it is usually found singly or in pairs. It looks similar to the Kentish Plover. The field mark to look out for is the "complete or nearly complete narrow black breast band in the male that continues around neck forming a black collar behind the white one". In the female, the band is rufous. It also has a thick black bill and white forecrown. Rob Hutchinson and other birders reported seeing them regularly in Sabang. Unfortunately, the spot where they would nest had recently been converted into a zip line area. We were surprised to find that the were still in the area. There were three birds sitting next to each other on the rocky ledge. One male Malaysian Plover, one immature Malaysian Plover, and one Lesser Sand Plover.